People love infographics, and the statistics prove it: In the past five years, Google searches for “infographics” have increased 25X. Sharing an infographic can improve website traffic by 12%. Some analysts even claim that 100% of businesses can benefit from sharing an infographic. 1. Listen: First, think about the topic you want to cover. What questions are important to your target audience? What surprising, useful or informative information can you provide? Also, select a topic that has high-quality research and data that can be used for the creation of visuals. 2. Focus: Your infographic topic should be clear enough to be communicated in a short sentence. If, for example, you have a broad topic like cookies, narrow it down to something such as: "How do cookie flavors rank around the world?" 3. Edit: Most people will only spend three-minutes reading an infographic -- be selective when choosing which information to feature. Delete any information that does not add value to your message. 4. Organize: Your content outline should start with your most powerful piece of data so that readers are hooked immediately. Order your supporting information so that it has a surprise in the middle, and builds towards a clear conclusion and a call-to-action at the end. 5. 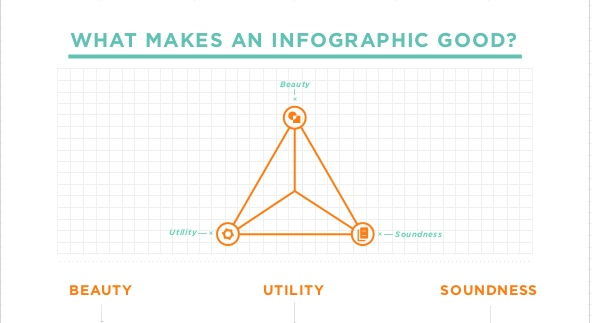 Visualize: Infographic designs should be inspired by the topic and data. For some great examples of visualization, check out Gareth Cook’s The Best American Infographics 2013. For more inspiration, see Peter Orntoft’s designs, which each feature a single photograph, and are a great reminder that the best infographics are customized for the content theme. Some more tactical tips: In the "largest scale visualization study to date," researchers discovered that memorable infographics typically use multiple colors, have more curved lines than straight lines, and are busy instead of minimalistic. The research does not explain why exactly these features are memorable, but the results are still valuable for infographic designers. Remember to collect feedback on your infographic from people who are representative of your target audience. Once you are confident in your creation, share it with the world! Leslie Belknap is the Marketing Director for Ethos3, a Nashville, TN-based presentation boutique providing professional presentation design and presentation training for national and international clients, ranging from Fortune 500 companies to branded individuals like Guy Kawasaki. You can tweet to Leslie @ethos3_leslie.